Ive been attempting to look for a source that can tell me if German armor trains were painted in Dunkagelb (dark yellow?) during operation Barbarossa, also would any of the captured rolling stock such as Russian armored rail cars be repainted? I had an idea for a diorama of German 6 rad and an 8 rad on flatcars painted gray and a the crews are looking at a German armored train with a captured Pl-37 attached to it with a panzertraggerwagen in the end. Here's a grab from a rail fan site. It matches other articles I've read. This subject seems to be a mystery to most military modellers, so here is a broad summary which should help modellers of the other 1/35 German rail kits now on the market and expected as well as those tackling the Baluard kit. I'd like to thank for his invaluable help my friend Chris Ozdoba, who contributed all the basic information for this section leaving me with only the job of sorting out the paint matches. Any errors in my interpretation of his notes are entirely my own! that wheel spokes were also red, leaving only their tyres in bare metal (JP has vague memories of seeing red wheels on locos during a visit to Germany about 1952, which may or may not be a survival of wartime practice) . Markings (serial numbers and insignia) were applied to this scheme in either RAL 9002 Grauweiss, a greyish white or RAL 1007 Narzissengelb, narcissus yellow. Baluard's decals are white, but the difference between this and areyis_h white is small enough not to matter. There were also three grey schemes which have caused great confusion. First, there was a special scheme for official photographs. These were taken on delivery of all locomotives, and because the monochrome films of those days gave poor results from a black subject an overall grey scheme was used instead. coat of matt light grey, RAL 7011. The markings were applied to this scheme in black but quickly became unreadable, and Reichsbahn offices near the front lines asked for a less conspicuous grey to be used. This scheme was therefore changed, on a date not yet discovered, to a darker grey, RAL 7021 (presumably also matt), with white markings. RAL colours are, of course, not easily used as references unless you have a set of RAL colour cards. I therefore give the closest Humbrol and FS 595a equivalents I can find. The black/red scheme seems to have been gloss, but for model purposes it is probably best to reduce the shine to a believable level with a coat of satin varnish. RAL 9002 Grauweiss - no Humbrol or FS595a equivalents, white with a very slight grey tinge seems to be meant so add a very little black to pure white; if using kit decals the black showing through their white will probably be close enough. RAL1007 Narzissengelb - yellow with an orangey tinge, Humbrol 154 matt insignia yellow is the closest in their current range but add a dash of orange 18 to darken it; FS595a 13432 is very close. That last one may cause a controversy - RAL 7021 often being quoted for the "Panzer Grey" applied to tanks. However I'm pretty sure of this match for railway purposes. It makes me wonder if the occasional reports of German tanks appearing black (for example "los negrillos" during the Spanish Civil War) refer to some which were painted in this colour. Could the military vehicle colour have started out as this shade and been changed to the lighter one we all know as panzer grey witff6CA a new RAL number being assigned, the old one being used as a reference although no longer applicable? Or might the RAL 7021 designation have been reused for the railway "off-black" when the standard vehicle colour ceased to be grey? Any experts on RAL colours care to comment? As a sidenote, I've just discovered that the Revell paint range includes colours matched to RAL7011 and 7021; I don't have a local stockist but I'll be looking out for these colours at the model shows this year to try them out! Freight wagons and box cars usually had black chassis, with metal superstructures also black and wooden ones a reddish brown. I've no RAL number for that colour, but Humbrol 133 satin brown seems a likely match; US readers should think of FS595a 301009 or 30111. It is unclear whether wood floors were painted or left as bare wood, but in any case wear would soon reduce a painted floor to dirty bare wood. Passenger wagons are a different story, which need not be gone into here as they're unlikely to feature in a military diorama - box cars were often used for personnel transport instead. " HM 1943, no.181, ordering the switch to Dunkelgelb base coat, which included armored trains, did not officially occur until Feb. 18th, 1943, well past the time frame of "early war period" and outside of the front-line service window for a SdKfz 231 (6-rad), (if any still existed even in anti-partisan service at this time). Photos of captured Russian armored trains in German use on page 21 of Schiffer pub. ; German Armored Trains in WWII, show the train with it's original Russian two-tone camo with the balkenkreuz painted directly on top of the still visible Soviet red star. Other photos in the same book show Russian trains in German use, still covered with the elaborately painted trees-design camo of their former owners. Some ex-Soviet artillery cars have enormous balkenkreuz garishly painted on the sides. Shturmovik pilots must have loved these. Thank you both for the quick response. Wipuld the panzer 38T been used on the Panzertraggerwagen early in the war as well? 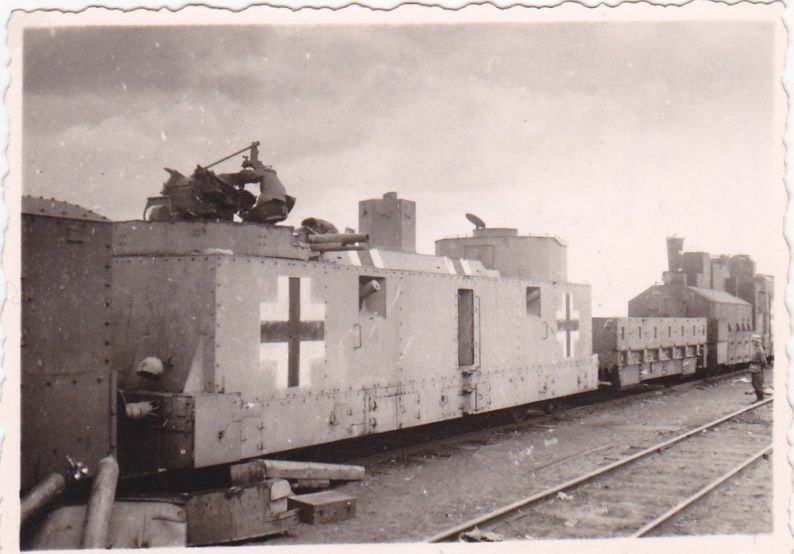 Maybe I’ll drop the idea of that but i still think it’d be cool to do a captured Pl37 in station next to armored vehicles headed to the front. The Panzerträgerwagen didn't come into use until 1942, although I don't have an exact date yet. These replaced earlier ordinary flatcars carrying assorted German light or captured french tanks, which were cumbersome to unload and move into action. Many captured Soviet (and Polish) armored trains were rebuilt, up-armed and repainted to German specifications after capture, but this would require them being sent to refitting facilities for this procedure. I’ve seen the flatcars with the captured French tanks on them. Maybe i can use a type imma and put up the side beams. Thank you for this information!